Update 15: 80 Endorsements! Thank you, all! Update 11: 40 Endorsements! Thank you all for the support! Update 10: Ashley Warpack: Legacy Edition is uploaded into the optional files section. The version utilizes ELE08's face, hair and squad-preview assets from the excellent Ashley Legacy Project. Big thanks to ELE08 for allowing to uses assets from the mod. Update 9: 300 Unique Downloads! Update 8: 30 endorsement. Nice, verrrryy nice. Update 7: V4 (The latest main file) has been updated with a higher mount priority to completely prevent conflict with SP controller mod. Update 5: TA DA! 20 endorsements! Thank you for all your support! Update 4: NICE! 200 unique downloads! Thank you all! Update 3: YAHOO!! 10 endorsements. Thank you all! Update 2: : Woohoo! 100 unique downloads! Thank you all very much! Ah, kark - I think I know what's wrong. Apologies, I'll see if I can't get a quick bug-fix out, by the end of next week. Now that is intriguing....may I ask if you have the "a lot" mod installed? If so did you install it after or before the Ashley Warpack? I do, but I have also tested this bug with Warpack as the only mod installed (with no graphical mods), and the result was the same. That was v6. When I tried v7, it was after the a lot, but I don't think that they conflicted? Like the textures were bugged, but the mesh still only changed for f!Shep. I'll try a clean install with the only mod being the v7 Warpack, but I doubt anything will change. Hmmm....I may have an idea as to what the bug is. I might need another week to test things out. Very nice mod, thanks. Now if i could find a mod that would stop Ashley from calling me Hero-Man. Thank you for the compliment. If you don't mind my asking: did you get a chance to see Ashley in the Griffon armour? If so what were your impressions? Griffon made me think i had an issue, as it seemed to have this missing-texture-purple at first, but it simply has that blue on the side. Admittedly not a huge fan, contrast between tones is a bit much. I have her wearing Ajax, and i think thats what shes going to keep, as it fits in fine with the color of her off duty catsuit, which i personally think is terrible on Williams (Ashleys whole ME3 "remodel" is bad imo). Otherwise, despite not using it, i probably would have enjoyed her other armor from your alliance war pack as well, but seems that was tied to EGM, and i don't have it on for current run. Looks fantastic. Thanks for the critique: I'll look into adjusting the Griffon's texture in the near future. Out of curiosity: What would you change about the Griffon's texture? As to the Alliance Warpack and the EGM: I may be biased, but I do believe the EGM is worth a restart of the ME3 playthrough. The team has really outdone itself in terms of content addition and improvement. Super hard to learn when someone replies on here. The griffon armor is fine, but id simply prefer it remained uniform, true to the look, perhaps making the blue much darker, or changing stripe color. It would be like having bright red on the Terminus instead of that fitting wine red, or a second lively color on Ajax, like a green, wouldn't go as well. Spectre has similar blue but, much like her EGM pack armor, you made it so much darker, that the neutral black would have worked with any second color. On EGM, ive already done a playthrough with it. The addons are just as top shelf as the main mod, miranda mod was fantastic, helped with romancing too as shes got close to nothing in ME3. The problem, and its a "problem" that only applies to myself, is that EGM adds a lot to ME3, extra missions, extra features, extra mini games, a lot of extras, and ME3 is not exactly my go-to Mass Effect (im a 1&2 kind of fella) so comes a point where EGM is stretching the games length by far too much, and despite how good it actually is, its overstaying ME3s welcome for me. I already know that non of it is going to matter and it frustrates me to no end. And as an "Ashleymancer" as some would call it, i have extra reasons to dislike the game, but again, reckon they apply only to me. I'd appreciate it. Also, I misspoke in my OP. I meant compatible with the ME3 Recalibrated mod. great mod. i with there will be full helmet armors for all fem chars tho :) that stupid thing they use in space, like liara does, it breaks immersion every time. Thank you - the Griffon armour was only possible thanks to considerable support from the modding community. Outstanding. Now if we can do Liara with and Armor set like this. Very nice work. If I may suggest something, you should compress your mod with 7z instead of zip. Total file size went down from 1.1 GB to 116 MB. 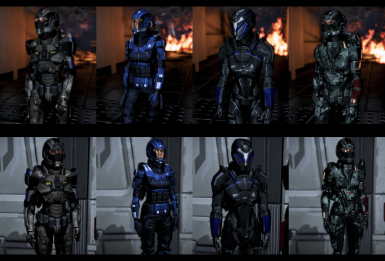 Is there a way to keep the armors from this mod, but have Ashley have her long, ME3 hair (the one she originally came with in ME3) without the helmets? I haven't really made mods Mass Effect 3 so I don't know how difficult or easy this could be. If it would be too complex to edit by myself, would you be able to upload an optional file that keeps her ME3 long hair? In the next update, I could try and make a long-haired patch - that being said: I cannot promise anything. Does this mod work with the Ash Complexion tweak? Sadly no - My mod is not compliant with it, yet. Thank you. When I push out the next update of the mod, I will remove that file and reduce the space.